Chinkapin or chinquapin is a small tree found throughout the southeastern United States. It has one nut in a bur that opens into two halves which gives the tree a distinctive chestnut look. Botanists have now condensed the tree's grouping of taxa to a single tree, Castanea pumila var. pumila and now consider that the chinkapin is one species comprising two botanical varieties: vars. ozarkensis and pumila. This tree should not be confused with chinquapin oak. The Allegheny chinkapin, also called common chinkapin, may well be the most ignored and undervalued native North American nut tree. It has been widely hailed as a sweet and edible nut and has been of value to its cousin, the American chestnut's breeding programs. It is, however, a small nut encased in a tough bur which makes for difficulties in harvesting the nut. The chinkapin's fruit is an interesting small, bur covered nut. The bur has sharp spines, 3/4 to 1 1/2 inches in diameter. Often the burs form in clusters on stems but each bur contains a single, shiny brown chestnut-like nut. Nuts are edible and quite sweet when mature in the fall. A horticulturist once remarked, "the Allegheny chinkapin makes your mouth water but to see it makes your eyes water," obviously liking both the tree's beauty and bounty. Other experts suggest that the tree is "well worthy of cultivation as an ornamental shade tree, even if we leave out of the account its rapid growth, productiveness, and delicious little nuts, which will be very acceptable for home use." There are several online sources where you can purchase the tree. Castanea pumila var. pumila can be characterized as a large, spreading, smooth-barked multistemmed shrub, 10 to 15 feet tall, or as a small tree occasionally single stemmed and 30 to 50 feet tall. Large trees are sometimes found in the landscape, especially where they have been groomed and encouraged to grow and where there are few competing trees. The Allegheny chinkapin is normally ready for harvesting in early September in the upper tree hardiness zones and later in the lower portion of the tree's natural range. These nuts need to harvested as soon as they mature. Prompt nut collection is a must as a large wildlife population can remove the entire crop in days. Again, one single brown nut is contained in each spiny green bur. When these burs start to separate and begin changing into a fall yellow color, its time for seed collection. The burs of chinkapin are normally no more than 1.4 to 4.6 cm in diameter and will split in two sections at nut maturity. Chinkapins are fairly susceptible to the Phytophthora cinnamomi root rotting fungus as are many tree species. The tree can also suffer from the blight of the American chestnut. The Allegheny chinkapin seems to be somewhat resistant to the American chestnut blight which is a fungal disease caused by Cryphonectria parasitica. Only a few heavily cankered trees have been found in Georgia and Louisiana. Chinkapins that do blight will continue to sucker and send up shoots from the root collar despite the cankering and will produce fruit. Legend has it that Captain John Smith recorded the first European record of the chinquapin in 1612. Cpt. Smith writes, "The indians have a small fruit growing on little trees, husked like a chestnut, but the fruit most like a very small acorne. This they call Checkinquamins, which they esteem a great daintie." Allegheny chinkapins are prolific producers of sweet, nutty flavored, small "chestnuts." They have attractive foliage and flowers, although the odor at blossoming time is considered unpleasant. Horticulturist Michael Dirr says "Allegheny chinkapin, has entered my plant life since moving south and makes, as I have seen it, a small shrub that could be used for naturalizing and providing food for wildlife." 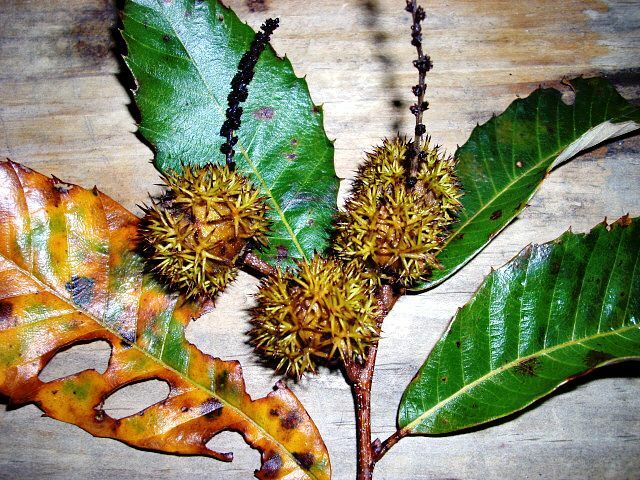 The great drawback of Allegheny chinkapin is its small nut size and the added disadvantage that many nuts stick fast in the bur at harvest and have to be removed by force. Because these nuts are small, are difficult to harvest and can germinate before harvest time, they have limited potential as a commercial crop. Good news is that the tree's small size, precocity, and heavy production may be useful characteristics to breed into the commercial chestnut species. The chinkapin is adapted to a wide range of soils and site conditions and should be considered for its wildlife value. The nuts are eaten by a number of small mammals such as squirrels, rabbits, deermice, and chipmunks. 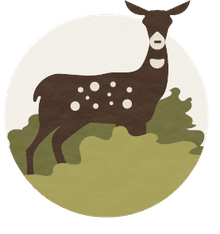 By cutting the stem at the ground surface, dense thickets can be established within a few years to provide food and cover for wildlife, especially grouse, bobwhite, and wild turkey. A fascinating tree considered desirable but listed as invasive.